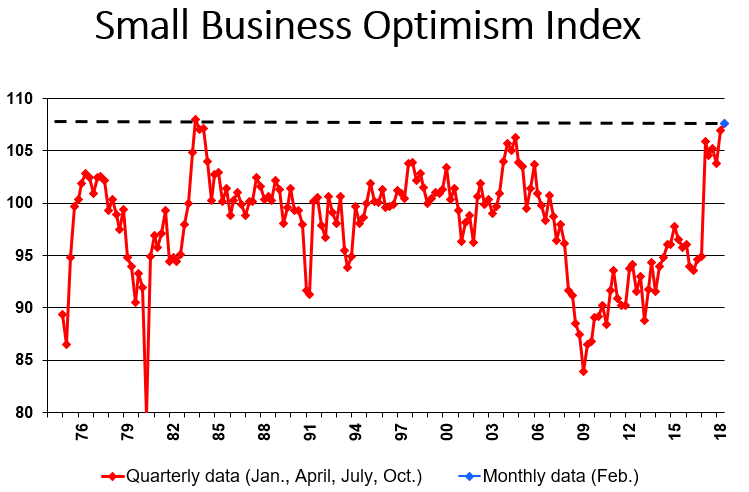 NFIB Small Business Economic Trends | US Registries LLC. Embargoed Tuesday, March 13 at 6 a.m.
Taxes received the fewest votes as the #1 business problem since 2006. Reports of few qualified workers remained the #1 problem, highest since 2000. Reports of improved earnings trends were the highest since 1987. Inventory investment was the strongest since 2000, fueling GDP growth. Reports of actual capital outlays rose to the highest level since 2004. The net percent of owners reporting higher selling prices continued to inch upward, reaching the highest level since 2014. Job creation posted another solid gain, hiring plans remained strong, and reports of labor quality as a top business problem reached record levels. Borrowing activity was flat, even though capital spending increased substantially, likely financed by improved profits instead of debt. Overall, the small business sector is very encouraged by the economic policies of the administration and the strength of the economy, willing to invest more and hire more if workers can be found to fill their open positions. Job creation remained solid in the small business sector as owners reported a seasonally adjusted average employment change per firm of 0.22 workers, a strong showing and a repeat of last month. Fourteen percent (up 1 point) reported increasing employment an average of 2.0 workers per firm and 10 percent (up 1 point) reported reducing employment an average of 3.5 workers per firm (seasonally adjusted). Fifty-two percent reported hiring or trying to hire (down 3 points), but 47 percent (90 percent of those hiring or trying to hire) reported few or no qualified applicants for the positions they were trying to fill. Twenty-two percent of owners cited the difficulty of finding qualified workers as their Single Most Important Business Problem (unchanged), exceeding the percentage citing taxes or the cost of regulation. Construction and transportation are the industries most affected with 37 percent of owners in each industry claiming labor quality as their top problem. Thirty-four percent of all owners reported job openings they could not fill in the current period, unchanged from January. Fifteen percent reported using temporary workers, up 3 points and the highest reading since November 2016. Reports of job openings were most frequent in construction (49 percent), manufacturing (32 percent) and non-professional services (37 percent). Labor shortages are serious and slowing the growth in output and employment. A seasonally adjusted net 18 percent plan to create new jobs, down 2 points from January but at historically high levels. Not seasonally adjusted, 27 percent plan to increase employment at their firm (up 2 points), and 3 percent plan reductions (unchanged). Hiring plans were strongest in construction (net 33 percent), manufacturing (net 26 percent), transportation and communication (net 30 percent) and professional services (net 26 percent). Historically an exceptionally strong outlook for job creation. The availability of qualified workers will undoubtedly moderate actual job growth. Labor markets are very tight, for both skilled and unskilled workers. To address this problem, a net 22 percent plan to raise worker compensation, historically high. Thirty-one percent reported raising compensation to attract or retain employees, the highest since December 2000, the peak of the last expansion. Only an increase in the size of the labor force can provide relief from the impact of labor shortages. Firms will be hiring workers with less than the desired skill levels, forcing them to invest more in training. Sixty-six percent reported capital outlays, up 5 points from January and the highest reading since 2004. Of those making expenditures, 45 percent reported spending on new equipment (up 1 point), 30 percent acquired vehicles (up 2 points), and 15 percent improved or expanded facilities (down 1 point). Six percent acquired new buildings or land for expansion (unchanged) and 15 percent spent money for new fixtures and furniture (up 2 points). Twenty-nine percent plan capital outlays in the next few months, unchanged from January. Plans were most frequent in construction (35 percent), professional services (37 percent), and manufacturing (39 percent). Improvements in productivity depend crucially on investment spending in the labor intensive small business sector. Improved earnings trends and lower taxes increase the pool of capital available for firms to invest in their businesses. About half of the firms making capital expenditures focused on equipment, most though are upgraded versions of equipment already in use, not necessarily major “hi-tech” switches. A net 8 percent of all owners (seasonally adjusted) reported higher nominal sales in the past three months compared to the prior three months, a 3 point gain following two prior months of strong readings. Consumer spending continues to provide solid support to economic growth. The net percent of owners expecting higher real sales volumes rose 3 points, to a net 28 percent of owners, one of the best readings since 2007. 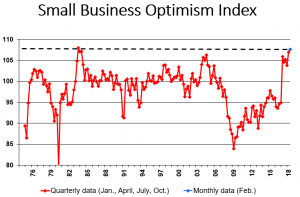 Positive expectations surged to over 30 points in December 2016, after the election and have remained historically high since then, reaching 34 percent in November 2017. Very positive sales expectations are undoubtedly behind the continued strength in hiring plans and capital investment plans. The net percent of owners reporting inventory increases rose 3 percentage points to a net 7 percent (seasonally adjusted) on top of a 6 point rise in January. Inventory stocks are building in anticipation of strong sales, at the strongest pace since January 2000. This is very supportive of GDP and employment growth. The net percent of owners viewing current inventory stocks as “too low” (positive number means more think stocks are too low than too high, a positive for inventory building) was a net negative 3 percent, 2 points better than January. With historically high numbers of owners reporting inventory building, stocks may be able to keep up with growing sales. If not, more owners will start reporting current stocks as “too low”. However, the net percent of owners planning to add to inventory rose a point from January to a net 4 percent – a solid number. Plans averaged 4 percent in the last six months of 2017 as firms geared up for increasing demand. Inventory investment was a major contributor to the growth in GDP in the second half of last year, and it appears that this momentum will continue into the first quarter. The net percent of owners raising average selling prices rose 2 points to a net 13 percent seasonally adjusted, after a 3 point increase in January. This is the highest reading since July 2014. Gradually, the Federal Reserve may be getting its wish for more inflation. Unadjusted, 9 percent of owners reported reducing their average selling prices in the past three months (unchanged), and 22 percent reported price increases (up 3 points after a 4 point gain last month). Still far short of the record 67 percent of owners raising selling prices in 1974. That was inflation! Seasonally adjusted, a net 24 percent plan price hikes (up 1 point), although far fewer will report actually doing so in the following months. This is the highest reading since 2008. With reports of increased compensation running high, there is more pressure to pass these costs on in higher selling prices, although the tax cut and growing operating profits alleviate some of this pressure. Reports of higher worker compensation remained at a net 31 percent, the highest reading since 2000 and among the highest in survey history. The Federal Reserve is hoping this will result in inflation as owners pass these costs on in the form of higher selling prices, but to date, their wish has not been granted yet. Tight labor markets are historically associated with high percentages of owners raising worker compensation. Owners complain at record rates of labor quality issues, with 90 percent of those hiring or trying to hire reporting few or no qualified applicants for their open positions. Twenty-two percent (unchanged) selected “finding qualified labor” as their top business problem, more than cited taxes, weak sales or the cost of regulations as their top challenge. This is the highest reading since 2000. Plans to raise compensation fell 2 points to a net 22 percent but still among the highest readings since 2000. Small firms are raising compensation to attract and keep the employees they need. The frequency of reports of positive profit trends improved one percentage point to a net negative 3 percent reporting quarter on quarter profit improvements, the best reading since 1987. This followed an 11 point improvement in January. Although the new tax law will impact profits this year, much of the current improvement is due to gains in operating profits and stronger sales. Small business owners have lived with austerity for eight years, their costs were well under control and the recent surge in sales bolsters the bottom line first before costs catch up. Two percent of owners reported that all their borrowing needs were not satisfied, down 1 point and at the record low. Thirty-two percent reported all credit needs met (up 1 point) and 51 percent said they were not interested in a loan, down a point. Only 2 percent reported that financing was their top business problem compared to 15 percent citing taxes, 15 percent citing regulations and red tape, and 22 percent the availability of qualified labor. Weak sales garnered 11 percent of the vote. Three percent reported loans “harder to get’, unchanged and at historic lows. In short, credit availability and cost are not issues and haven’t been for many years. Loan demand has not returned to its pre-recession levels. Thirty-one percent of all owners reported borrowing on a regular basis (unchanged). The average rate paid on short maturity loans was down 20 basis points at 5.7 percent. If the Federal Reserve raises rates the anticipated three times this year, variable rate loan costs will respond immediately, although longer term rates are not likely to reflect the full hike. Overall, loan demand remains steady, even with cheap money. Small businesses have been restructuring over the past ten years and profit trends are improving, leaving owners in a good position to borrow once they need financing beyond the resources provided by their firm’s operations. Growth in the fourth quarter was revised down to 2.5% after 3.2% in the third. This is misleading because consumer spending grew at 3.8 percent, and this is 70 percent of GDP. Business investment grew 6.6 percent. However, the mathematics of GDP subtract from spending all demand that is satisfied with inventory made in prior periods (GDP measure output in the current period). Thus, 0.7 percent was deducted from the growth rate. Additional reductions resulted from a rise in imports (spending money on goods made in other countries does not increase our GDP). All that to say that underlying spending in the economy was much stronger than our GDP math indicated. The Federal Reserve is expected to raise rates again at the March meeting, the first of three expected raises for the year. It also continues to let some of its $4 trillion dollar portfolio mature without reinvesting the proceeds. This reduces the demand for bonds, putting upward pressure on interest rates. On top of this, the Treasury will be selling a lot of bonds to finance the deficit, which imposes additional pressure on rates. Rising rates will, of course, not be a positive force for equity prices or asset prices in general. Interest rates on variable price loans will rise. Less clear is the impact on long term rates, but they are likely to ease higher. The small business sector is on fire. The pickup in capital spending is a very favorable sign, as capital spending (crucial for improved productivity) fell way behind from 2009 to 2016. Improved capital spending signals increased confidence in the future of the economy. Hiring is excellent and would be stronger if the labor market were not so tight. This is and will be a major constraint on growth. Inventory investment is strong and will add to GDP this quarter, hopefully it will be purchased later in the year by customers. Inflationary pressures from Main Street are minimal although reported hikes in average selling prices have been edging up. After years of small businesses sitting on the sidelines and not benefiting from the so called recovery, Main Street is again on fire. NFIB began surveys of its membership in October 1973. Surveys were conducted in the first month of each quarter through 1985 when monthly surveys were instituted. The first month in each quarter is based on between 1,200 and 2,000 respondents, while the following two monthly surveys contain between 400 and 900 respondents. The term “net percent” means that the percent of owners giving an unfavorable response has been subtracted from the percent giving a favorable response. If, for example, 20 percent reported that they were going to increase the number of workers at the firm and 5 percent reported an intention to reduce the number of workers, the “net percent” would be 20 percent – 5 percent or a net 15 percent planning to expand employment. These figures are seasonally adjusted unless noted. The graphs show quarterly data (first survey month in each quarter), updated when available by subsequent monthly surveys.